Hello mishmashlearning, not seen you for a while. I now blog more frequently about my art through http://www.andyknillart.com. So December – last year I took part in an event in Swanage calls Artisans on the Beach for 7 weeks. By the end of it I was announced as Artisan of the Year and it was suggested I should be on the committee / working group for the proposed 2018 event. It is now 2018, I am one of two artisans on the working group. This year the Artisans on the Beach event started on December 1 and finishes on January 2nd after about 5.5 weeks. I have also become named event organiser from the artisan aspect and taken on tasks including the social media marketing on Facebook and Instagram. I have at last arrived at that old phrase transferable skills – organisation, spreadsheets, social media work etc , when someone praised my organisation skills I was at pains to point out the demands were less than those needed for a days teaching. I am enjoying my role and will be asked no to be considered to repeat the role for 2019 and possibly subsequent years. My art is also found at the Purbeck Artisan Yard, Wareham. There I have found myself producing admin. Documents again for the same reasons and those skills again. My artwork is d finitely selling more in my second year. I have greatly increased the range of my work available and initiatives like Christmas cards started for December 2017 now account for a third of my card sales of over £2k. I am back doing winter training with Swanage Sea Rowing and haven’t injured myself so far, so fitness is increasing gradually. I hope in 2019 to be out exercising much more. Memories – December has been a difficult time for my family the last two years. Mum passed away in 2016 and last year at this time I sat by Dad’s side before he passed away on Christmas Day. I had a dip thinking about this last week while at the huts one day. I now feel in a better place but will miss the family gathering in Broadstairs even though I found them hard myself from a mental health perspective. Mum and Dad both believed in an afterlife, so I hope they can communicate with each other easily again and are happy with what they see their offspring up to these days. Clearing the family base as it is now sold (almost) turned up many memories and items from their lives and their families too. My eldest has made changes in his life this year but is still difficult to communicate with, I wish him all the best and stay in contact when possible. My youngest took on a job this year and has shown much maturity about work and maturing in some ways. My mother in law at 96 continues to thrive but it would have been nice for where we live now for her to have retained more of her sight so that she could see the birds and wildlife more easily. Finally Anne, my fab wife of 25 years now who I am getting to know again now that work is not a barrier that separates me from the family as it had a tendency to do when teaching. So Christmas Day rest well washing up for me tomorrow. Then back to the hut but hopefully a focus on positive memories. Seasons greetings to anyone that still follows this blog. For those of you who read and support a bit of an update. GOB is now 61 days, on the 12 March my first journal will be full. I attended Teachmeet Poole last week (Thursday 23 Feb) and as a presenter received a nice notebook which I shall use to continue the GOB journey. Those who know my background and change in circumstance might well challenge, why is Andy at a teachmeet? It’s a fair question. I had looked up to see if Jenna Lucas’ TMBournemouth would be on and found details of the event in Poole on Differentiation. I immediately thought what about a piece on Solo Taxonomy, whose enthusiasm has not left me. I offered my services and settled to participate in the break marketplace and fill any other gaps that arose. I ended up in a mock classroom in the corner of the school theatre presenting to the entire teachmeet. Not what I had expected but I just got on with it. I loved talking about Solo. As I finished I made the point, from the chap in shorts and polo shirt, that this was my first time in a school building since November when I had a nervous breakdown and left teaching. It was a great evening to see the enthusiasm of young staff. There was repetition of many familiar ideas I have seen previously but I was left to wonder how long they would stay in teaching and knew it was unlikely to be as long as I had managed and that still upsets me. Anyway apart from that I have been sketching with other artists for PAW (Purbeck Arts Week) at The Etches Collection – fossils of Kimmeridge. I liked the setting, found the number of experienced artists quite intimidating tbh. However it was a link back to degree days with Jo Angseesing my palaeontology lecturer. In fact my eyes were drawn a lot to the architecture after the urban sketching trips I have attended with both London and Cambridge groups previously. I have taken some photos to allow follow up on this. Yesterday, March 2nd, I had a conversation with a mental health professional about a local programme Steps to Wellbeing, and after being very open and honest about what the last six months have been like – a range of triggers, it was felt and I agree that I am doing all that I can to recover and don’t need additional input outside what I am doing already for myself which overall is working. Yes there are slips and dips but that is the nature of depression and anxiety. In fact after the phone talk I went out on an standee walk from the house along the SW Coast path. T-shirt, shorts, walking boots and a sweatshirt for when I stopped plus camera. In the end I walked about 8 miles, took over 200 pictures (the advantage of digital) many of landscape and waves, enjoyed fresh air and sunshine, got muddy but felt great. Today the weather is back to cloud, wind, rain and more time indoors I suspect. A rambling post, not pre planned as usual but flowing from my thoughts. I live in a wonderful place, I have an active lifestyle. I share delights of hares, deer, numerous birds with most of my family. I live a sort of semi-retired status and it suits me. 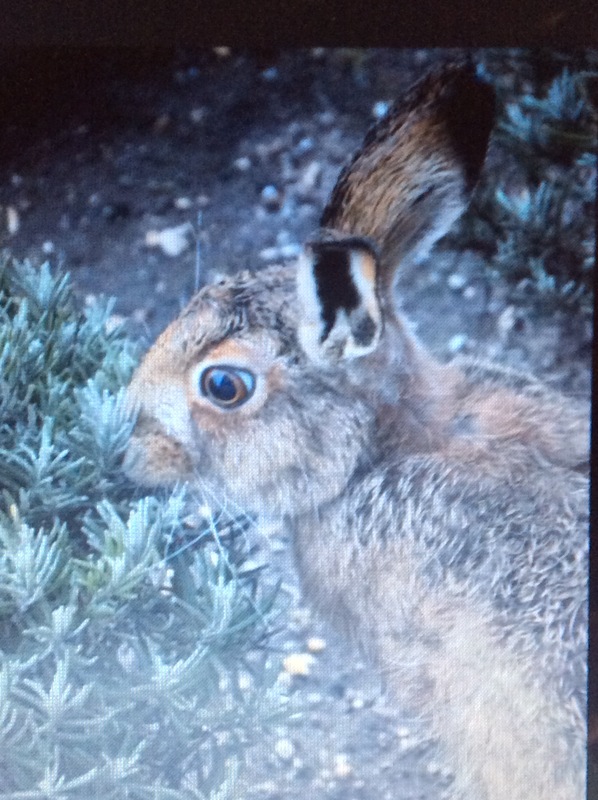 Our friend Morris the Mad March hare who may mean we have ravaged lavender bushes, but it’s a price worth paying. On a visit to London recently with Anne, I bought some books after browsing in the Tate Modern shop in the basement. A shop that often reveals some tempting books, including this time most of the shelves on London just inside the shop to the left windows. Over the years I have visited London with my family when I grew up in the Medway Towns (pre teens 1966 – 1974). Visit favourites included Royal Festival Hall for Ernest Read concerts series, the Nutcracker ballet; Selfridges and Hamleys; London Zoo and memories of Pipaluk the polar bear cub, camel rides and the penguin enclosure. As a teen I came up to the Royal Albert Hall for The Proms and space in the gods. The museums in S. Kensington. Visits tended to be to one area then a return journey on the tube and then a return journey by train. Gradually I became a bit more adventurous and would walk from area to area when exploring on my own, finding streets where I got away from the main crowd. Favourites included Camden Market, area around Tottenham Court Road and Covent Garden. These days at last I try to avoid the tube and either walk or travel by bus so that I can admire the areas I pass through. I am more confident about striking off the beaten path and have walked back from meetings depending on a rough sense of direction. A walk with Dan Raven-Ellison looking at play spaces in London between Whitechapel and Islington added to that sense of adventure. As a geographer – back to that post – do I always think about geography? – I love to see new places, I enjoy the walking even though I have ended many a n unplanned walk at Liverpool Street station with sore feet. Now I have more ideas to follow up on, more areas to take obscure pictures in and places to discover thanks to the two books I have read since that visit that I started with 8 days ago. The photo story of Joseph Markovitch and his life around Hoxton – an area I know for the Circus school and square with its varied exotic bicycles chained to the railings – cargo bikes and fixies. An idea that appeals – rediscovering the smaller communities amongst the London sprawl. I have been through some of these areas, even looked through some of these store windows. Now I have a guidebook to discover more areas, possibly even plan a route in advance. So, yes I have started well, but remember we are in the holidays, the book reading challenge will be more pressured once I return to work. However, maybe fewer tweets or blog posts and more books – it’s not as if we don’t have plenty of them around the house in shelves or in storage in the loft. Time will tell. Maybe if I post about the books I read it will also make me think more about them and not just rush onto the next task / project.